Sometimes it happens to receive a lot of votes for a simple answer, ten minutes' work, whereas an excellent or elaborated one earns fewer votes it deserves. A famous example of the first kind is David Carlisle's answer to the grandma's question. A recent instance of the second type is another David's post which is the cleanest among the answers to that question but not the most upvoted (at the time I wrote this post). Which is your best answer among the ones which received few votes? If you are too humble to point out your own answer, you could highlight another user's one. You could also extend this to questions. This basically creates a completely new style and for all the work it did not even get accepted by the OP and only a single upvote :( There are many similar answers of her/him but I guess since most bibliography questions are about tweaking something to fit some very particular style, they are often not widely applicable and therefore terribly underrated - but maybe it's just the missing ducks. I also answer a lot of linguistics questions which since few people use those specialized packages tend not to get many votes. I do, however, get many thanks from random people at linguistics conferences, which makes up for it. I think one of mine which required a good slice of work but got only 1 upvote is this answer to the question "Justifying ('ragged right/left, center') all the tables in a document". There might be others but I think only 1 upvote is a bit harsh even if this answer is not applicable for anyone else. https://tex.stackexchange.com/a/369953/9057 is a typical example of mine for answers that are in a mad challenge with an answer of @egreg (see David's comment to the question above). If egreg answers a question the best you can do is either to not try to answer it too or—if you have already answered it—delete your answer before someone else can see it. 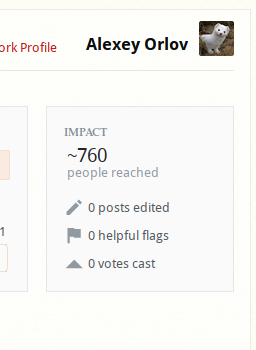 On the other hand https://tex.stackexchange.com/a/366576/9057 was a 5 minutes answer (most of the time was needed to make all the links) with too much votes for. Eventually, I managed to find a Steven B. Segletes's answer that I remembered. I think it's a simple and very useful way to align text within table cells (a thing particurarly complicated to beginners). At the moment I'm writing, it earned only 3 upvotes. This answer is exactly the opposite. I just showed OP the utilization of \hyphenation and got about 15 upvotes in that day and a couple more a few days later.